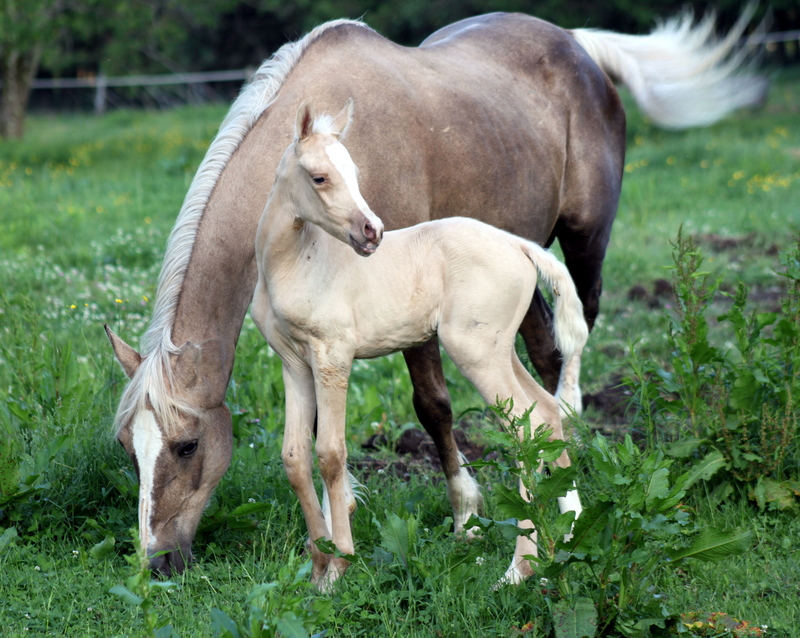 Only two foals left to go! We are very excited to see what our new stallion is siring! His first foal for us is AWESOME! 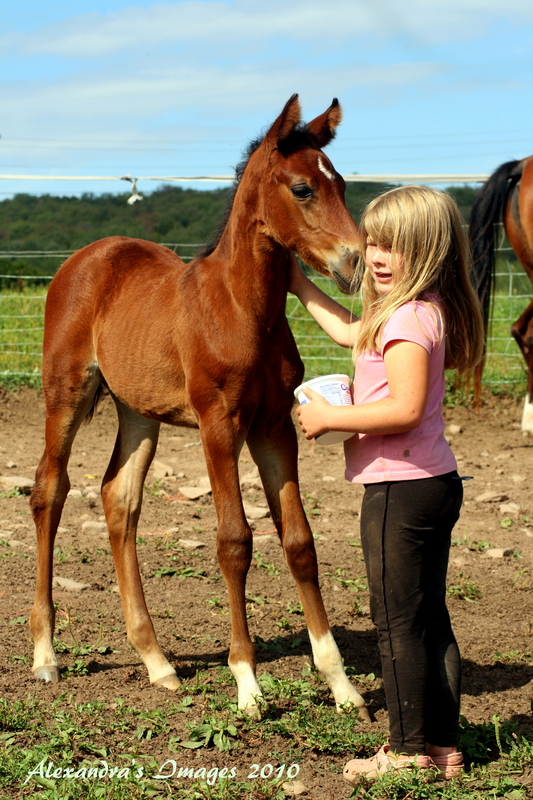 A gorgeous carbon copy black colt! We can't wait to see what comes next! ***UPDATE!! All foals now have LIVE links to their very own pages. Just click their names or photos to go to their individual pages and see more photos and information. Carolina FA- (Poznan-The Golden Rocket) Born May 31, 2010 (Memorial Day) while I was away at a family wedding in North Carolina (hence her name). 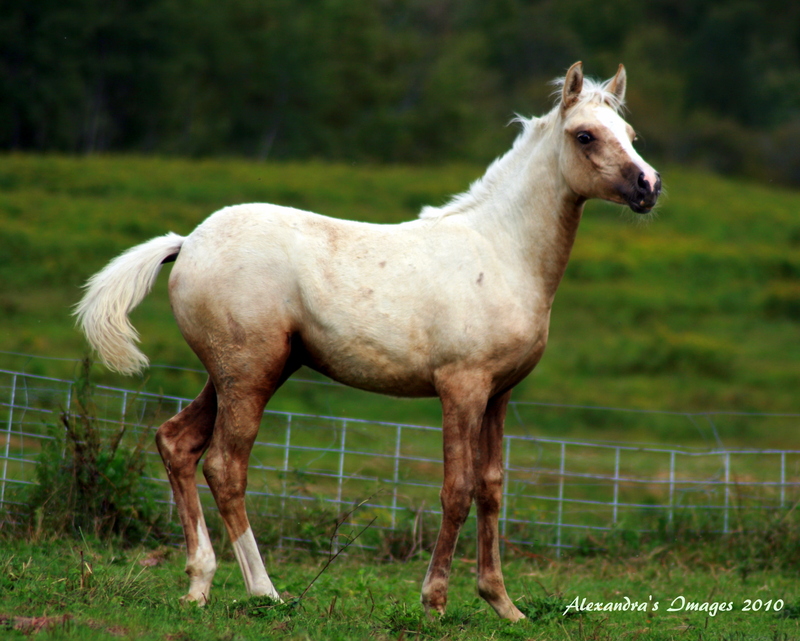 Her dam is none another than the incomparable The Golden Rocket- a 7/8 Arabian palomino mare who has never failed to put outstanding colored Half Arabian foals on the ground. Carolina resembles her dam more than any that have preceded her so she is definitely a keeper. She is sired by our very own Poznan sired by Magnum Spatz and out of our former Polish broodmare Polasingul giving this filly a pedigree containing Magnum Psyche, Gallup, Gdansk, Padron and Crabbet breeding on her dams side including the great Count Dorsaz and Rissalix. Although Carolina is the result of an "unplanned" breeding (her dam is 24 this year and supposed to be retired) we couldn't be happier with the result. NOT FOR SALE. 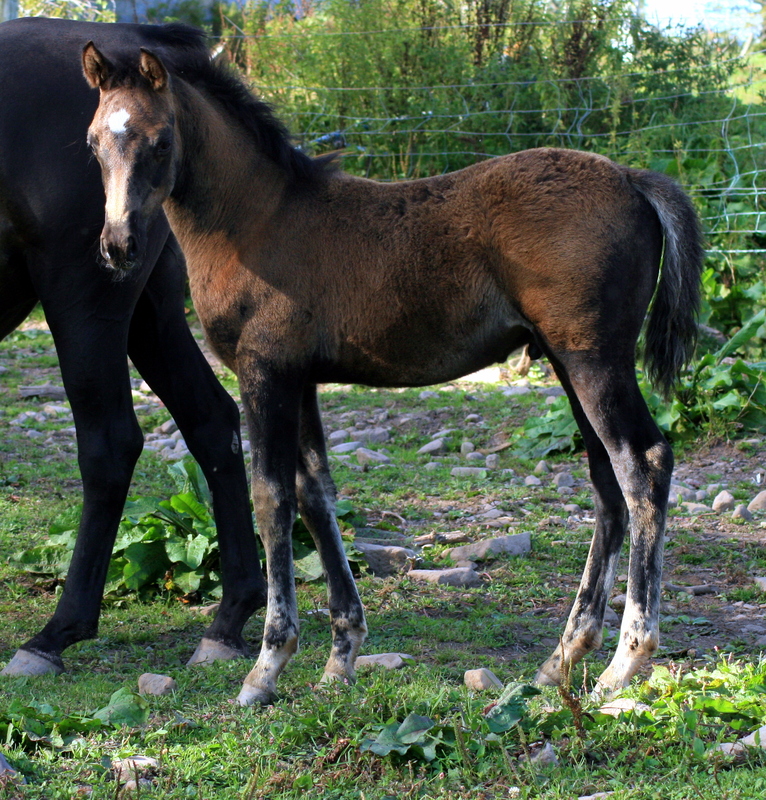 Foxwillow's Storm Morning- Born July 17, 2010, our first gaited foal! Out of a full sister to International Champion VBF's Storm Warning, lots of substance and pretty too! She's already fiesty and curious, wants to be involved in everything you do. Can't wait to see how she matures- her mother comes pretty darn close to perfect as far as Rockies go, hopefully Storm will follow in her mother's hoofsteps! Pistolla FA- July 20, 2010, sired by Kuhailan Artex out of Goodknight Irene, this colt is an example of what we have been striving to produce and is a true success! Gorgeous head, excelllent conformation and lots of substance. Plus, he's a little sweetheart already. He has an older pedigree with three crosses to Niga as well as lines to Pistoleero, Proud Silver, Tornado, and the magnificent Bask Knight. This colt's sire and dam are almost reflections of each other phenotypicaly and this young man certainly has the potential to be a very prepotent sire someday. It will be a true joy watching this one mature! There are many poor quality blacks out there today- this is not one of them.